The summer holidays have flown by and as August ends our thoughts turn to the start of a new school year, an exciting time but also one that can be uncertain and nerve-wracking for so many. Here the uniform has been purchased, tried on and (almost) labelled and Mini Reviewer, Izzie, is raring to return to school. However when Izzie started school last year, we all had our fair share of nerves! So if you have an apprehensive school starter or a child that is a little reluctant to go back to school, don't panic! There are lots of books out there offering gentle reassurance and showing that school can in fact be lots of fun! Here are our five favourite books celebrating school life as well as a little "Back To School" tradition of our own. 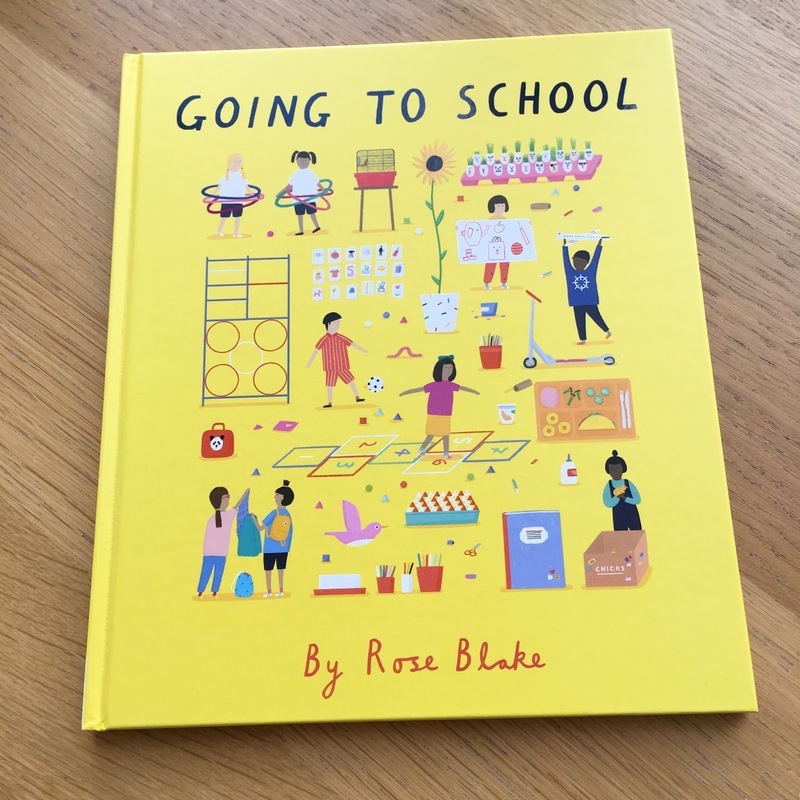 Going To School by Rose Blake is a great new book for children starting school or who are in their first few years of primary school. 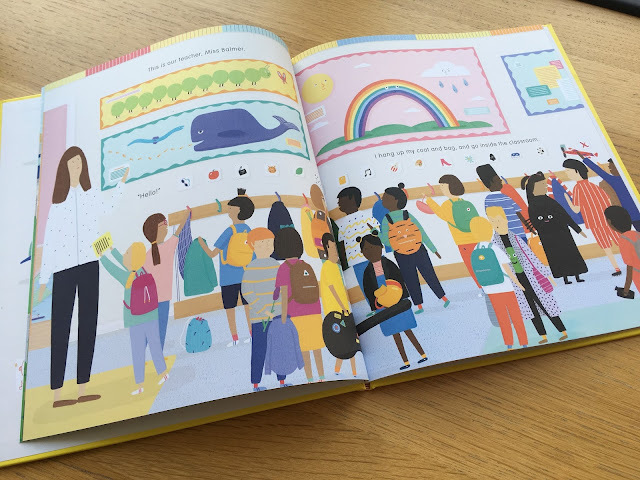 The colourful double spreads show a day in the life of a young school girl and her classmates. Starting with her journey to school and finishing with home time, we join her for playtime, lunchtime as well as all the lessons in between. 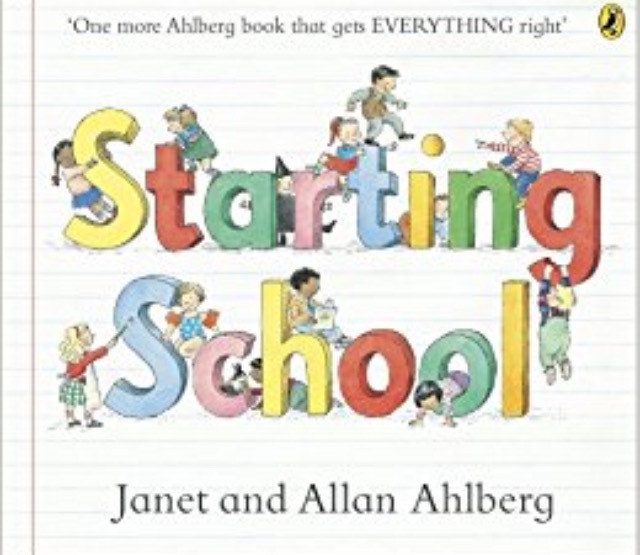 With so much to spot and discuss, this book will help talk about starting or returning to school in a positive and cheerful way. 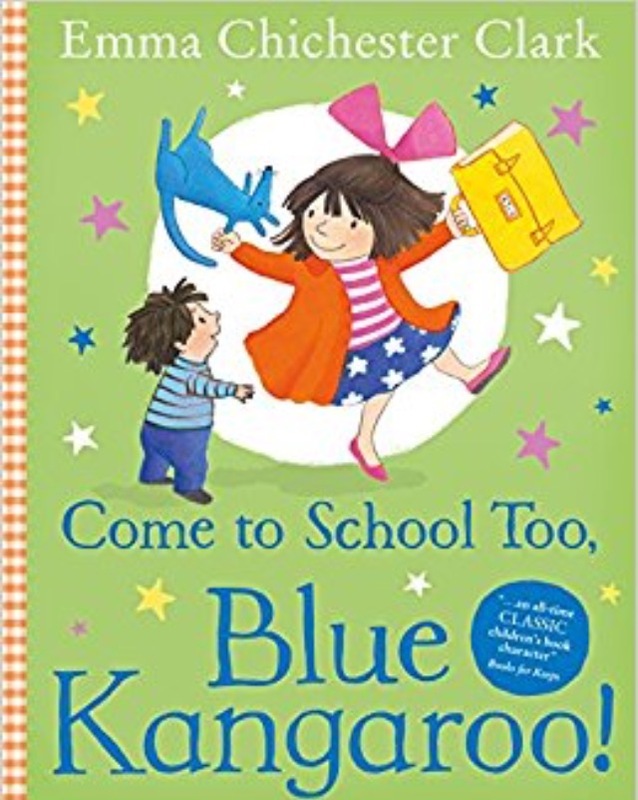 Come To School Too, Blue Kangaroo! is from the series of books by Emma Chichester Clark about a little girl called Lily and her magical friend, Blue Kangaroo. 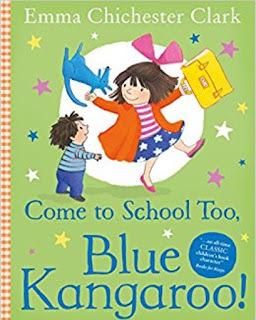 In this story, Lily is starting a new school and Blue Kangaroo is going to go too. This is a great book for young children starting school or moving schools. It gently offers reassurance about common concerns as well as showing what a typical school day might involve. By the end of the story Lily is no longer worried and is looking forward to going to her new school again. 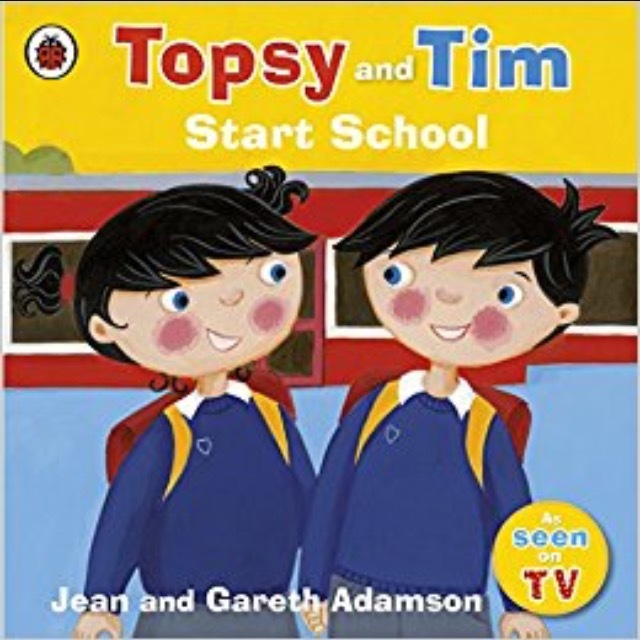 The Mini Reviewers love watching Topsy and Tim on CBeebies and we recently picked up a great collection of stories from our local charity shop, which conveniently included Topsy and Tim Start School. 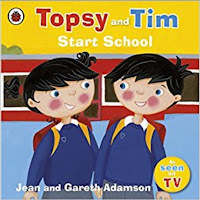 Join Topsy and Tim and their friends for their first day at primary school. As with all the Topsy and Tim books this one is packed with colourful illustrations and even has a puzzle to solve at the end. We came across Chu's First Day at School last year when Izzie started in Reception. 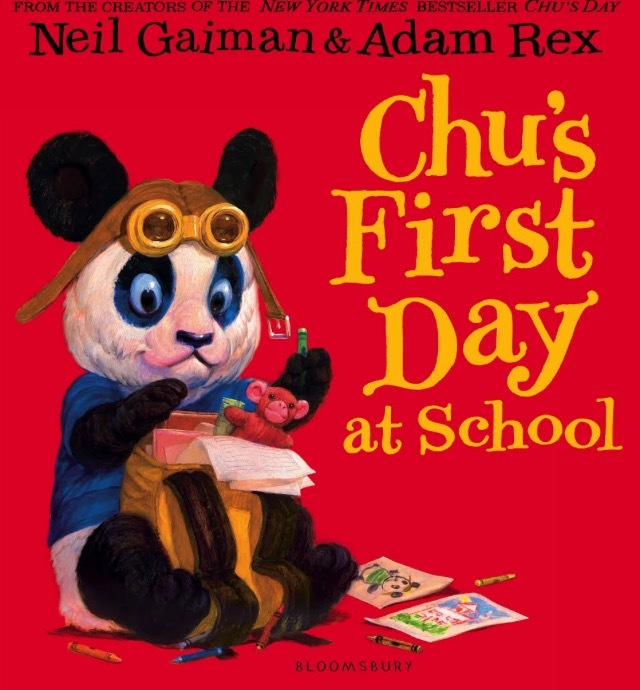 It is a lovely illustrated story about a little panda called Chu with an enormous sneeze! 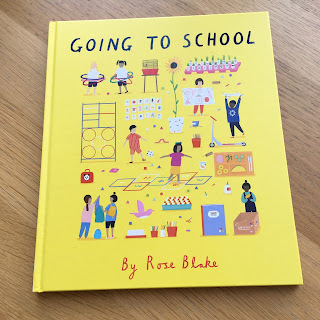 He is worried about starting school and whether his classmates will accept him so it's another great book offering gentle reassurance to little ones. 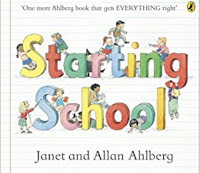 Our last choice is Starting School by Janet and Allan Ahlberg. I grew up with the Ahlberg books and get very sentimental about all their stories: Peepo, Each Peach Pear Plum, The Baby Catalogue, The Jolly Postman and Starting School is of course no exception. It is the classic choice to read together and introduce the school routine to children. 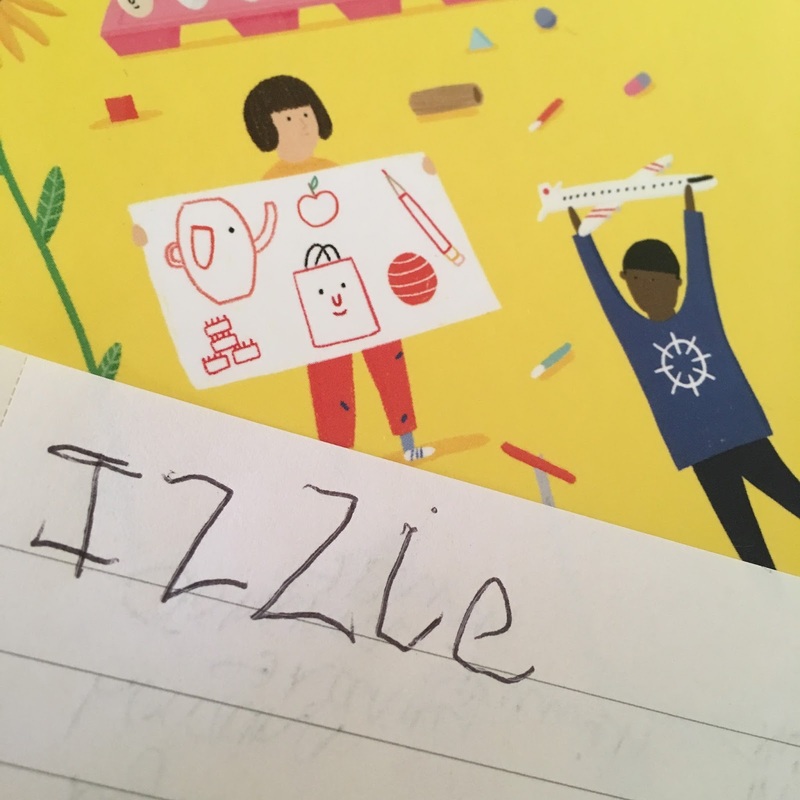 Last year Mini Reviewer, Izzie, started school and we started a new tradition, a Back To School interview. You can read more about why here. Amazingly we remembered to dig out the questions and here are this year's answers. I love them as they completely reflect Izzie's developing sense of humour, she was definitely trying to wind me up! What makes you happy? Playing with playdough. I love playdough. I'm going to have playdough in Class 2. I'm fairly sure she was trying to persuade me to get the playdough out, she knows Mummy hates playdough! Tell me something about yourself? I have brown hair. Who is your best friend? O, K and E - a lovely group of girls from her class. What would you like to be when you grow up? A vet. What does a vet do? Looks after dogs and cats and (she pauses, looks at me and I know what is coming...) also sticks their hands up cows' bottoms! This is a running joke in our house as it was how my Dad put me off being a vet at a similar age! What is your favourite thing to do? Playdough! Where is your favourite place to go? To Cannon Hall Farm. Really? Yes because I got to see reindeers and had an ice cream after. Izzie visited Cannon Hall Farm with her class. What is your favourite colour? Pink and purple. Do you have a favourite animal? Giraffes. What do you like about giraffes? They crunch leaves! What do you like to eat and drink? Pasta with sauce (she HATES pasta with sauce!) and I like to drink milk. What do you like to watch on TV? My Little Pony and Tinkerbell. What would you like to learn or do at school this year? To add up to 20 (I'm fairly certain she can do this already) and to sing in the choir! Finally we'd like to wish everyone starting or returning to school lots of luck. We hope the tears are minimal and the days full of fun! * We received a copy of Going To School for review purposes. All opinions are as always our own. This post contains affiliate links. I love School and Chu's First Day at School. Have pinned your post. This is a great list of back to school books, we had Starting School in our review too. I love Izzie's answers, I remember you doing this last year and I did the same with my son when he started nursery. Will have to do it again this week! I was just talking to my sister the other day about starting school books as my niece starts next week! The only one of these we've read is the classic Janet and Allen Ahlberg. I really ought to dig it out for my niece! These are great. I think books about life and topics such as going to school can be really useful for kids and I love relatable books too. Angela from The Inspiration Edit.